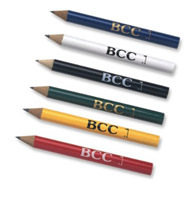 With your firm imprint or logo, our promotional pencils, make great promotional items. See our wide choice of pencils below. These items will make a big impression to promote your business by advertising with promotional products.. This means that everyone will see the pencils with your company imprint or logo, use them, and think of your firm when they need your product or business. It is also a great way to promote a specific event. Lowest price starting at: $0.13 each. Lowest price starting at: $0.27 each. Lowest price starting at: $0.11 each. Description: Country club quality at bargain basement prices. Lowest price starting at: $1.29 each. Description: A twist from one of our best sellers! The all new Triple Click Pencil is sure to be an instant classic! Lowest price starting at: $0.19 each. 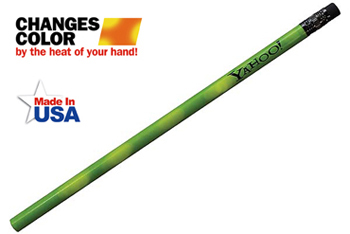 Description: Quality #2 lead pencils, hot-stamped with your client's message. Lowest price starting at: $0.17 each. Lowest price starting at: $0.15 each. Lowest price starting at: $0.26 each. Description: A favorite pencil among construction companies.